Visiting St Catherine always brings back resonant memories for me. Looking back at my notes, I see that one of my visits was on the Easter Monday of 2009. The busy rituals of the last few days now over, it should have been time to relax in the sunshine, but for the first time in nearly a week, the sky was overcast with thick grey cloud which glowered at the land beneath. It was a day which would have suited Good Friday rather better. And yet, I always feel energised by the events of Holy Week. The daily going-to-church puts me in touch with the experience of my medieval ancestors, and it is rather awe-inspiring to take part in the the liturgies which they knew at this season. It reinforces my sense of medieval churches as a touchstone, and I was glad to be cycling out in the lonely parishes around Stowmarket, even if I might have hoped for some sunshine. 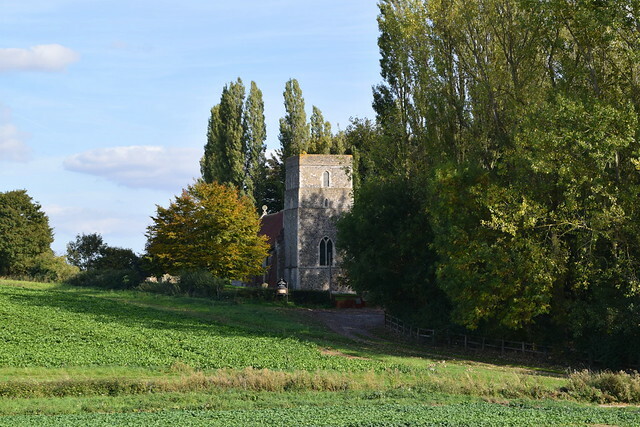 In fact, the weather on that day had rather suited St Catherine, and I also remember the first entry for this church on my Suffolk Churches website back in October 2001. I had observed then that late autumn was a good time to visit St Catherine. And now it was 2018, and late autumn again. The church sits beside a wood, on a hill above the narrow road. It sounds idyllic, but this is agricultural country. There is a hardstanding area for vehicles below the rise of the ploughed field, and the containers parked on it on this muddy day made it bleak. I thought then, and think now, that this was not a bad thing, and as I pushed my bike up the steep swampy track I could easily imagine Victorian funeral processions making the same journey. The tower of St Catherine is certainly quite something. It is that unusual thing for Suffolk, a square Norman tower, with very little alteration since. Looking back at the south side of the church, you can see the roof beams protruding, tied and braced to the outside of the wall with huge wooden pegs. 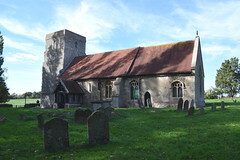 Generally, the exterior of the church has been patched up rather than rebuilt, with massive brick buttresses on the north side, although there was a proper restoration here by diocesan architect Richard Phipson's, the porch a typical one from his Boys' Bumper Book of Genuine Medieval Features (1878 edition). Phipson was a conscientious architect, and his work has a degree of comforting self-confidence. And there is something stern and glowering beyond to contrast the church with, a high perimeter fence at the top of the opposite rise. We'll come back to it in a moment. St Catherine is kept open all the time as, I suppose, all parish churches should be. I always look forward to coming back, because, in my opinion, St Catherine is pretty much what a remote village church should be. It is clearly ancient, but entirely refurbished inside. There are no major monuments or significant medieval liturgical survivals, but it is open. 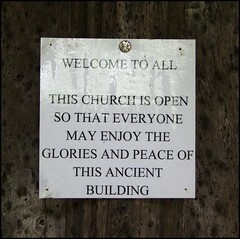 Not for tourists then, but as a church open for prayer, or even just for the special silence of an ancient place. It is dim inside without being gloomy, and a bit damp, making an organic transition between graveyard and church. You can sit here awhile, and know you are in the presence of God. I like that a lot. The village of Ringshall is a surprisingly large and suburban place, but a mile or two distant from here. You'd never know it was nearby, not least because of the way the corrugating ridges around here cluster and conspire to hide the landscape. As with virtually all parish churches, money was lavished here in the late 19th Century, and a lot of it was spent on stained glass. The glass is early work by Clayton & Bell, dating from the time of Phipson's restoration. 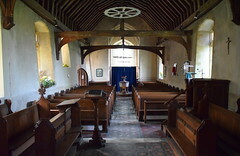 It is clustered in the chancel around the sanctuary. 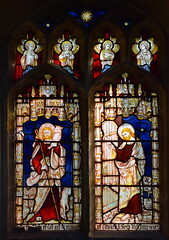 The best of it is in the east window, depicting the Resurrection of Christ and Mary Magdalene meeting the Risen Christ in the garden. Less good are the familiar pairing of the Good Shepherd and Light of the World in the south side of the chancel. Clayton & Bell would not often return to these particular subjects. 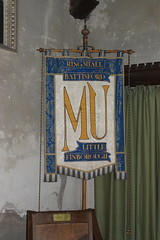 But they remain as a lovely and valuable statement of what seemed important to a remote East Anglian parish in the 1870s. 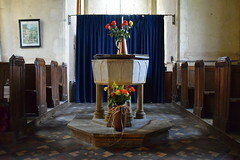 There is one of those 13th century Purbeck marble fonts more familar from the east of Suffolk, supported here on pretty Victorian pillars. 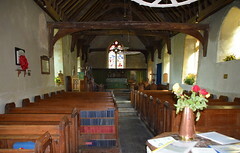 Everything else, pretty much, is Phipson's, although the rough-hewn roof beams look ancient and must have been reused. They look low enough for you to hit your head on. Unusually, there is what appears to be a piscina set in the east wall of the sanctuary, behind the altar. Phipson was far too liturgically literate to reset one there, and it doesn't appear to be an aumbry in disguise. Why it is here and not in the south wall as usual is a mystery. 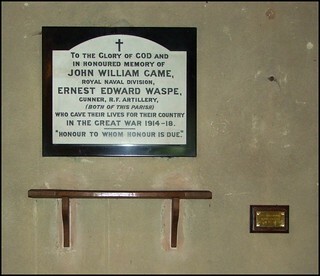 Up in the sanctuary hangs the standard of 74(F) Squadron Royal Air Force. It was put here in 1992, to remain until it turns to dust. 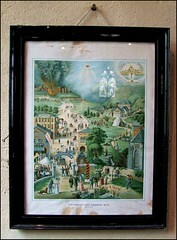 An unusual survival is a real period piece hanging up at the back of the church. It is a picture called The Wide and Narrow Paths, and it was the sort of thing produced by evangelical church societies in the late 19th Century, intended for hanging up in a house rather than a church. It depicts all the stumbling blocks on our journey through life. Verses from the Bible are used to illustrate where we can fall. As far as I could make out, it looks like we are all going to hell. Back in 2001, I had come here a week or so after the invasion of Afghanistan by American and British forces, in the wake of the destruction of the World Trade Centre. Now, I stepped outside into the graveyard, where the day was still deciding whether or not to bother me with rain. The graveyard is wide and open, the long grass climbing the slope. I walked up to the top of it, and found that the extension eastwards consisted almost entirely of military graves. Looking westwards, there was that perimeter fence again. 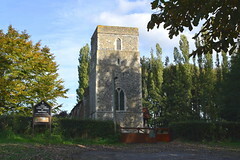 St Catherine is one of three medieval churches on the edge of the Wattisham airfield, one of the country's major military helicopter bases. At the time of my first visit, many of the people here were involved in the assault on Afghanistan. The thought of this was quite a contrast with my feelings about the inside of the church. 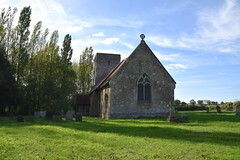 The other two medieval churches beside the base are at Great Bricett, near the main gate, and the village of Wattisham itself, where the church is now redundant. Of the three, St Catherine is most obviously the one that serves the local military community. The ancient ways that once linked these three communities have now disappeared beneath the towers, hangers and runways of the western military-industrial complex. I wandered back down the slope of the graveyard, and as I did so a huge pheasant exploded from behind a headstone. It fled into the woods, whirring like a helicopter. As I watched it go, I saw what I should have noticed before. There were about a dozen of them, perched silently in attitudes of stupidity and defiance, on stumps and branches, watching me warily. Their sullen splashes of red were an empty threat in the darkening day.